How do you deliver value in medical sales? How do you deliver value in medical sales? You might think you understand this intuitively, but unless you qualify or quantify value with respect to your customer’s needs and perceptions, you’re guessing at best and you risk losing the sale. In this edition of the Medical Sales Guru Podcast, Mace Horoff takes a look at defining value as it is most commonly assessed in the medical arena and suggests ways to incorporate value in your presentations. Every medical sales rep knows to ask probing questions. Make sure you are not asking probing questions that a medical professional might find insulting! One of the worst ones is, “Doctor, tell me about the biggest challenges you have when you are …..?” Mace Horoff, medical sales speaker, trainer, and consultant offers some thoughts on why a question like this can be perceived as insulting to a medical professional and then suggests a more subtle, non-insulting approach to uncover the information you need before trying to offer a solution. Many medical sales people are good at delivering the details about their products, and without question, the ability to do that is important. But this alone does not make you a “sales person.” In fact, if this is all you do in your medical sales presentations, you are really more of a “detail person.” Yes, you can earn a good living as a detail person (many people in the pharmaceutical industry do this), but you will miss out on the higher incomes that are paid to truly effective medical sales professionals. In this Medical Sales Guru podcast, Mace Horoff explains the difference between sales people and detail people, and what you need to do to make sure you are “selling” and not just “dumping” product data. Ask a medical sales professional the best place to sell, and he or she will probably tell you, “anywhere the prospect or customer will listen.” Sure, you can sell anywhere, but anywhere is not always the best place! Nothing beats a scheduled (or unscheduled) sit-down appointment in the healthcare provider’s office or other location where you can have a focused conversation with a minimum of distractions. Mace describes why you need to make this kind of meeting with your prospects and customers a priority and how to get the healthcare professional to give you the time you need for a proper, complete sales presentation. 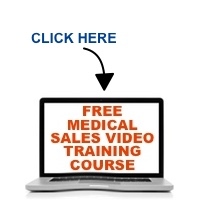 Who Is Your Medical Sales Presentation About? When you give a medical sales presentation to a prospect or customer, who is the presentation about? The question is not WHAT, but WHO is it about. Too many sales reps make the presentation about themselves, their companies, and their products and truthfully…your prospect can care less. In this edition of the Medical Sales Guru Podcast, Mace Horoff describes WHO the presentation needs to be about and why.